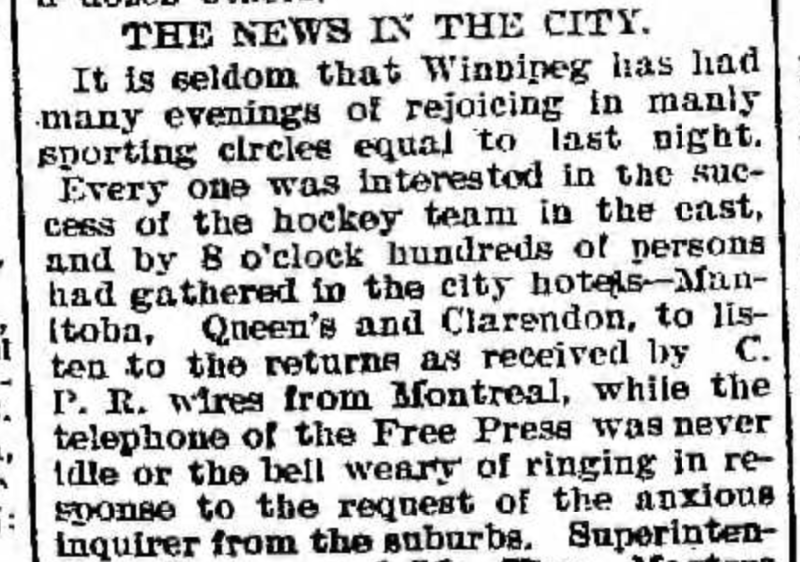 Since at least 1896, when the Winnipeg Victorias traveled east to face and defeat the Montreal Victorias in a one-game challenge for the Stanley Cup, hockey fans have been coming up with ways to follow the game when they couldn’t be there in person. Telegraph lines first made this possible. 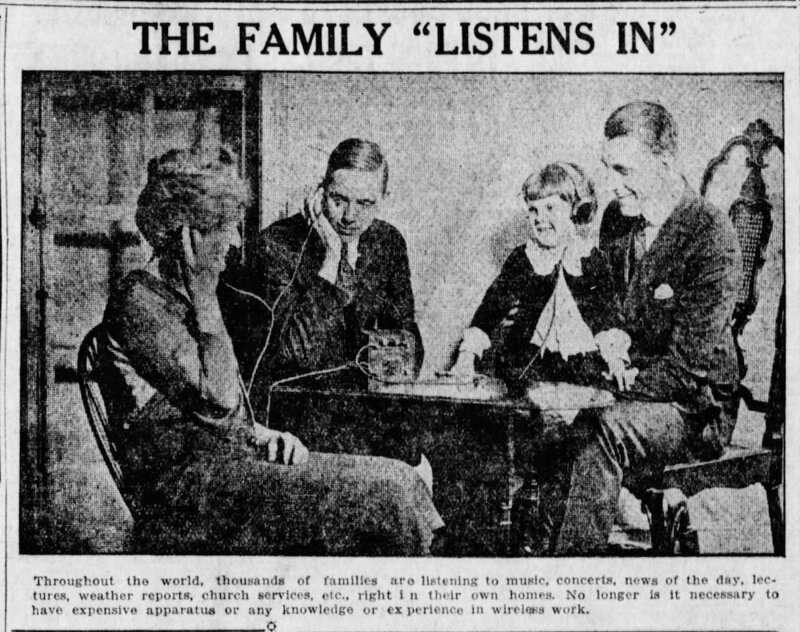 Special wires were often set up in hotels, where people could gather in comfort to hear scores and details, or outside of train stations and newspaper offices, where people had to stand in the cold. The Manitoba Free Press, February 15, 1896. Of course, you didn’t have to wait in the cold if you didn’t want to … as long as you had a telephone. Newspaper offices often put extra operators on duty to give out score updates to those who called in. But beginning in 1922, newspapers had a more efficient way of getting scores out to anyone living within a thousand miles of their office. They could do it with the magic of radio. The Vancouver World, March 21, 1922. I’ve written before about my interest in early hockey broadcasts. (See … Radio Active and …Listening In.) The technology was virtually brand new in Canada in 1922. The earliest radio stations had been set up in Montreal in 1920, but it took another two years before the concept took off. According to the timeline of The History of Canadian Broadcasting on the Canadian Communications Foundation web site, no other stations came on board in 1921, but by 1922 there were 23 new stations in six more provinces across the country. Many of these new radio stations were owned by newspapers, including CFCA in Toronto, which was owned by the Toronto Star and would feature the first live play-by-play hockey broadcasts by Norman Albert, and then Foster Hewitt, in February of 1923. 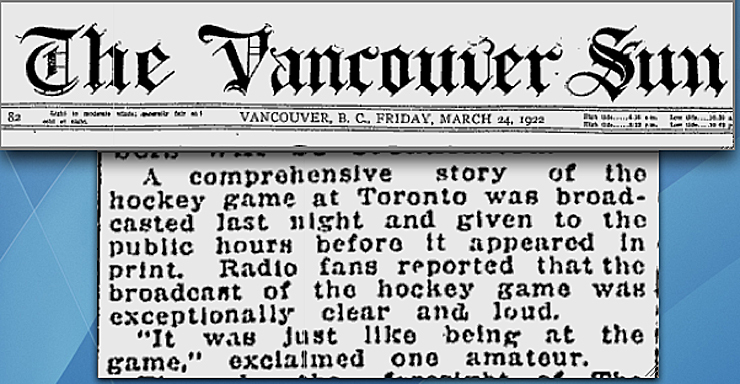 The Vancouver Sun reporting on its radio coverage of Game 1 in the 1922 Stanley Cup Final. 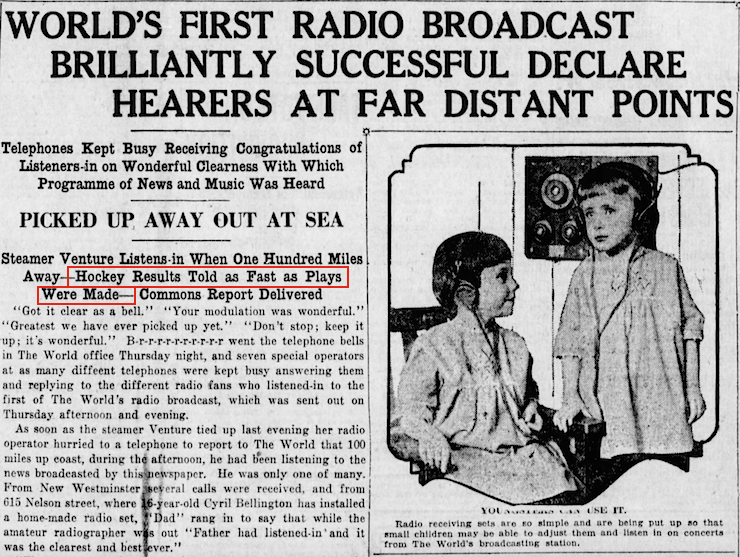 Eleven months before those hockey broadcasts in Toronto, in March of 1922, three Vancouver newspapers — the Province, the Sun, and World — were all racing to get their own radio stations on the air. The Province was first, on March 13, followed by the Sun two days later, and then the World on March 23. 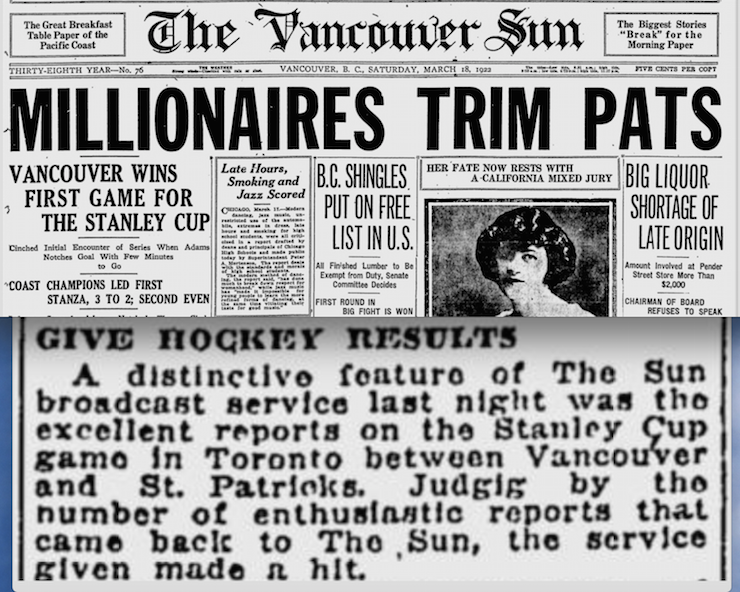 Unfortunately, the archives of the Province can’t be searched on line, but the others can, so we know for certain that in addition to news reports, stock prices, and musical programs, the Sun and the World (likely the Province too), were providing almost up-to-the minute reports on the Stanley Cup Final between the Vancouver Millionaires and the Toronto St. Pats which took place in Toronto between March 17 and March 28. The Vancouver Sun, Game 2. Toronto won 2-1 in overtime. From the newspaper accounts, it’s unclear exactly how much information the Sun was providing for its listeners during Vancouver’s 4-3 win in Game 1. Just the scores? Or was some effort being made to recreate (or at least read) the play-by-play accounts that telegraphed reports had long been able to relay? And were they providing more by Game 2? The Vancouver Sun, Game 3. The Millionaires won 3-0. It’s hard to imagine anyone reporting “that it was as good as being at the game” if all they were getting was score updates. But Sun readers were reporting that again after Game 3. The Vancouver World, March 24, 1922. When the World reported on its triumphant first broadcast, which had been made the day of Game 3 on March 23, it bragged of “Hockey Results Told as Fast As Plays Were Made” but provided no further details of what that actually meant. The Vancouver Sun, March 27, 1922 and Vancouver World on March 28. 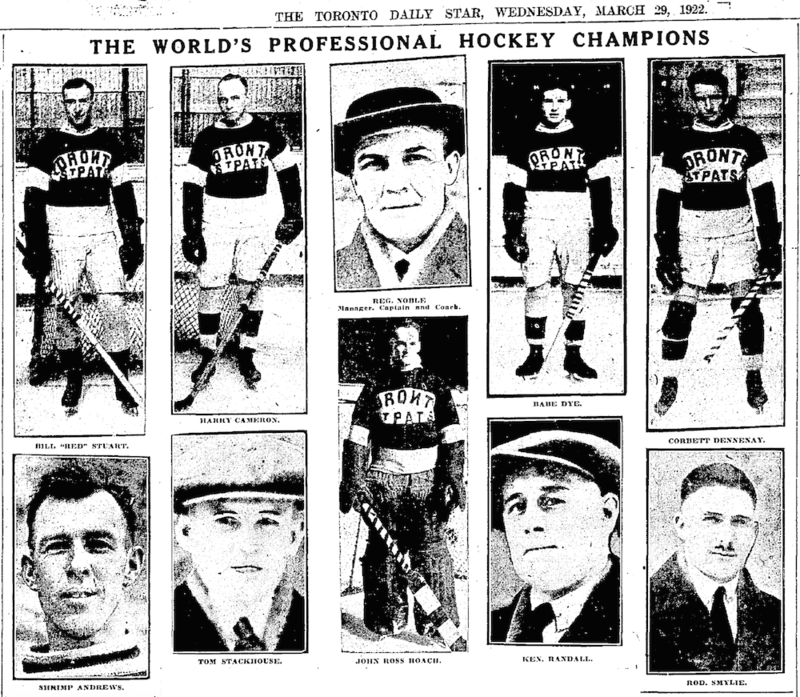 After a 6-0 win for Toronto in the fourth game of the series on March 25, the St. Pats and Millionaires were even at 2-2 in the best-of-five series. Interestingly, the Sun noted on March 27 that it would be “giving a complete and comprehensive story of the final world series hockey game” … but the game wasn’t actually played until March 28! By then it appeared that the Sun station had already given up on daily broadcasts, and all the World was promising was the final result, which would be a 5-1 Stanley Cup-winning victory for Toronto. So, whatever it was that fans in Vancouver were tuning into 95 years ago, it was far from the multi-platform experience we’ve become used to today. But everything has to start somewhere! Another interesting article! Thanks, Eric. Another great hockey story. Thanks Eric. Also brought back memories from my public school days (late 50’s – early 60’s) at South Prep in Toronto. Foster Hewitt’s book “Hockey Night In Canada”, was in the school library. It was a great “read” for a 9 or 10 year old kid at the time. Thanks for stimulating our thinking again. Great column as usual. Got me thinking about the 1970’s movie “The Sting” and how races were called in to betting parlors. I also remember the last day of the 1967 baseball season when the Red Sox were battling the Tigers for the pennant. Folks around Everett, Massachusetts were glued to their transistor radios listening for the outcome of the Tigers/Angels game before they could celebrate the Red Sox winning the pennant. That game, played in Detroit was not televised so the radio was our conduit to the game. The Red Sox radio network patched into the Tigers/Angels game. Thinking back now, some 50 years later, it was a magical way to follow the game.